Culture/Date: Roman, 1st – 3rd century C.E. The art of gem carving or intaglio dates as far back as the seventh millennium B.C.E. By the second millennium B.C.E., engraved gems had developed into a full-fledged industry in the Indus Valley. Through trade, these objects reached the Mediterranean. By the fourth century B.C.E., we find numerous references in Greek texts to Eastern gems. Carnelian stones, which were immensely popular throughout Greco-Roman antiquity, originated from deposits in the Arabian Peninsula and India. Like the Egyptians and the Greeks, the Romans believed that the carnelian stone was endowed with magical powers capable of warding off the evil eye. 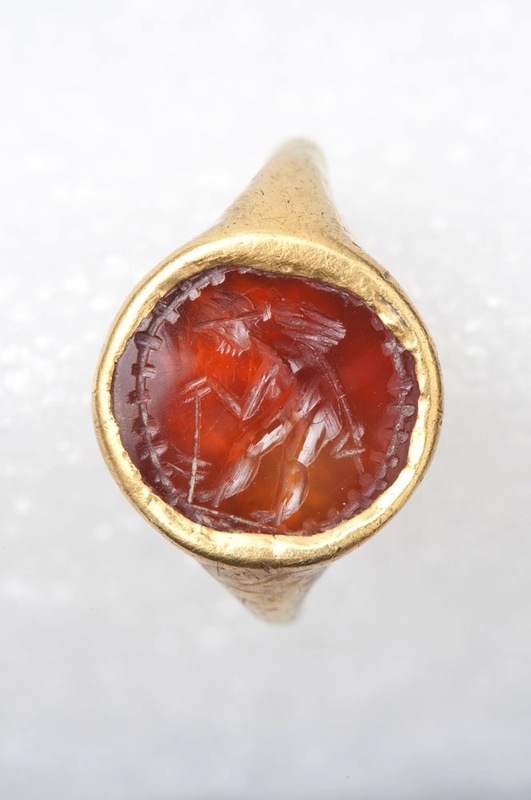 The small size of the gold ring with a carnelian stone in the JHUAM suggests that it was intended for a child. The ring’s engraved gem portrays a male figure who wears a round hat and holds a walking staff. These attributes are often associated with the god, Hermes, known to the Romans as Mercury. Hermes was the son of Zeus and Maia. Even as a baby, he was endowed with great cunning. In fact, Hermes was said to have stolen King Admetus’ cattle from his older brother, Apollo, soon after his birth. After he had sacrificed several cows to the gods, he used their innards to produce the strings of the first lyre. He later traded this instrument for Apollo’s staff, the caduceus, as part of a truce. The caduceus became the object that Hermes would use to lead the souls of the dead to the underworld. Thus, Hermes became the patron of merchants and travelers. In antiquity, engraved gemstones were often meant to reflect the personal characteristics of the wearer. If so, it is possible that this ring might have belonged to the son of a merchant, and been intended as a way of encouraging the child to follow in his father’s footsteps. Intaglio gems were regularly used as signet rings. Since the gold and carnelian ring in the JHUAM was most likely worn by a young child, it probably did not serve this purpose and was meant, instead, as a form of identification and protective amulet. Before the fifth century B.C.E., Hermes was usually depicted as a bearded man. But, in the early classical period (circa c.480–450 B.C.E. ), he began to be represented as a young god, just as he appears on this engraved gemstone. By the first and second centuries C.E., engravings on carnelian stones become more prevalent in Roman rings. Furthermore, the rough, impressionistic style of the carving on this particular gem suggests a date in the Roman Imperial period. Grimal, Pierre. The Concise Dictionary of Classical Mythology. Paris, France. Presses Universitaires de France, 1951. Print. Robinson, David M. “The Robinson Collection of Greek Gems, Seals, Rings, and Earrings,” Hesperia Supplements, Vol. 8, pp. 305-323+475-480. 1949. Vermeule, Cornelius. “Near Eastern, Greek, and Roman Gems: A Recent Gift to the Collections,” Boston Museum Bulletin, Vol. 68, No. 353. pp. 197-214. 1970.